The following diagrams show either failures by Black or plays which create a ko. However the ko is not as good as in the /Solution. How about this? is an interesting move. White has to be very careful in order to kill Black; looks like the only move. puts White on the spot. Either let Black live or fight expensive ko. If White decides to go for the kill with then Black even gets the first ko capture at a. Can anyone find something better? nando: If at , life still doesn't look obvious to me. What is the sequence please ? After Black answers at . Best White can get is a (sente) seki up to . Arno: you are right, at kills Black. Still works this way, I think. Notochord: Sorry: you are correct, I misread this variation. 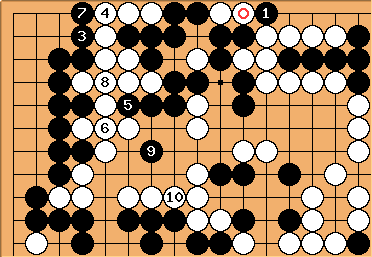 'b' for seems to be the only move. is a killing move here. And this way, I think. Just connecting directly should also pretty clearly work, since its practically the same thing, and the most vital point. unkx80: Here , and kill by the usual eyespace reduction method. Notochord: I'm not sure that needs to be obeyed. needs to go at the best place for eyeshape. unkx80: Sorry but I can't help feeling a bit tired explaining this again and again. (But really, it's not your fault.) I shall leave it as a reading exercise this time. If you can solve Beginner Exercise 196, then you should be able to solve this as well. DJ: May I have a try? What about below? Do I overlook something? nando: What if at a ? Arno: yes a a kills Black. The long sequence shows nicely that a fight can carry on into parts of the board which you have not imagined earlier. Although in the end, the "long sequence" fails (sometimes only by one liberty in a semeai). Dave: What a great idea! I had only considered the case where playing 5 as soon as possible starts a large ko at 8 where Black has a huge number of internal ko threats. Dave: So White has to give way and play at something like a allowing Black to live with ? Loses the fight in the end. Dave: Black first turns aside at threatening to capture the center stones. After , Black can not cut with because White a will create a snapback. However, is a real threat that White must answer. Then the question comes up whether White has to play (in which case wins the larger fight). If would not be atari, White can plan herself and win. Dave: Here also forces and then we need to know whether is atari or not. looks like winning it. 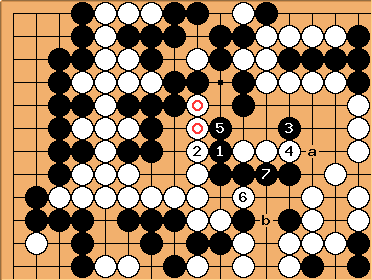 It threatens to capture the two stones, so White's best guess is . threatens the cut off the large group so White has to . But then makes miai of a and b. The long sequence: finally alive? 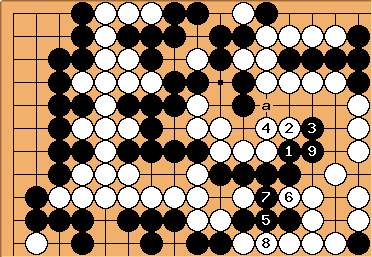 Instead of playing a immediatly, Black plays . White has to play , but then makes miai of a and b so Black finally lives, or doesn't he? Because of the cutting point at Black can neither make a second eye here, nor capture the White dragon. I looked at the moves a - e (the last one with followups f and g. In these variations the stone provides the crucial liberty for the white top group in the semeai). So I think the the long sequence (in all variations) fails. When Black plays , White has time to play because cuts the center Black stones. 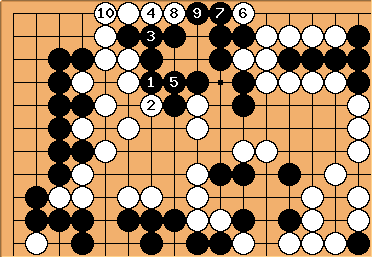 Even though Black bends around with and to increase his liberties, White has just enough liberties to win the fight against the center stones (see below). White is ahead after with six liberties to only five for Black.